When I was approached to listen to "T.S.L." by The Sound Logic ... I asked them to complete my wee blog interview. I've said before how much I enjoy getting under the skin of an artist ... and appreciate it when they relax and tell it as it is. 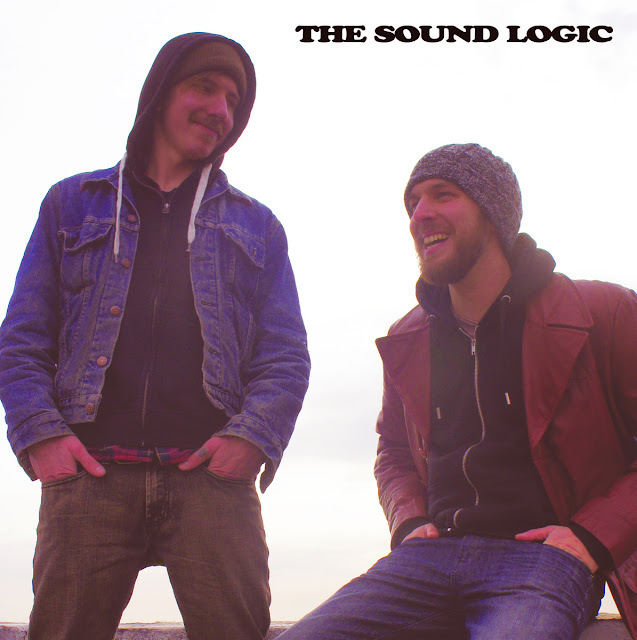 We are The Sound Logic, a two-piece band based out of Detroit, MI. The band consists of Jeff Knol on vocals/guitar (left) and Yuri Pavlov on drums (right). We do music. Currently we are working on promoting our debut self-titled album, “T.S.L.”, playing shows, booking tours, and writing new music for our follow up album, which we hope to have out by summer 2014. Yuri - I am inspired by pretty much everything around me. I try to find something unique and musical in my surroundings. As far as music goes, I love watching the classic drummers, Rich, Bonham, Moon, Baker, Blakey, etc., they always inspire me to play better and keep working on new ideas in my drumming. My parents and my wife also inspire me every day, in that they constantly support me in everything I do. Right now, most of my inspiration comes from the city of Detroit, MI. I spend a lot of my time in the city, and love seeing all the people working hard to keep the city going. The Detroit music scene I think is doing wonderful things, not only for the bands and bars, but for the city as a whole. Whenever there are shows, local or national, in Downtown, people are out and about, spending money within the city. That is inspirational. Jeff - Inspiration comes from everyone I know, meet, see, and those I’ll never know exist. That is more of the emotional/lyrical aspect of inspiration. To me music paints a picture in the mind and the reverse is true. A brick wall, dark alleys, or a bright city street all inspire music to me. Most of what i see is Grand Rapids, Muskegon, and Detroit MI. Those are the places that inspire me the most. In those places the local artists are a huge inspiration. I love an intimate show with a person sharing who they are with me and 10-50 other people. Seeing/hearing their hard work inspires me to be better. This might be silly but new gear is inspiring as well. A new guitar, drum, amp, etc...really just pull me out of musical habits and make my creative brain work in different ways. It feels really cool. Yuri - The number one thing that drives me is the love of music. First and foremost, I am a lover of all music, and I love to play all different styles as well. Just knowing that I created something that people care about, and can relate to, is the most gratifying feeling ever. All of our friends and fans that come to our shows also drive me to continue, and for that I want to say “THANK YOU” to everyone that comes out, supports us, and supports the Detroit live music scene. Jeff - In the early stages of my life with playing music, it was rebellion. Playing guitar was my way of saying f*** off. That morphed into defiance. I used music to share an idea, or give an opinion. It was just part of activism at a very local grassroots level. Then came aggression. I couldn't get my guitar down tuned enough, heavy enough, or play fast enough. From there music turned inward and became mostly self-expression and storytelling. The sound became more bluesy rock and roll. Now that I’ve typed out how music has been a part of me, I’m not seeing how i explained what drives me to it. I think music is what drives me to it. That and I would not know what to do with myself without it. Jeff - Hope and passion. Yuri - Community plays a huge role in what we do. The entire Detroit music scene is one big community, and that community supports us and the other local artists that are playing music for fun. Without a sense of community and family, I think being a local band anywhere would be tough. Jeff - Community plays THE role. Communities are groups of people and people are what make music happen. Thanks to all the patrons, listeners, critics, musicians, bookers, promoters, bartenders, bar backs, roadies, bouncers, fans, writers, and artists. Keep it alive! Next we are going to continue promoting our debut album, “T.S.L.”, which will be available on iTunes, Spotify, Amazon, etc., in June 2013. We will continue writing music for our follow-up album, and will continue playing shows everywhere we can. I would heartily recommend “T.S.L.” ... have a wee listen below and get your freak on.